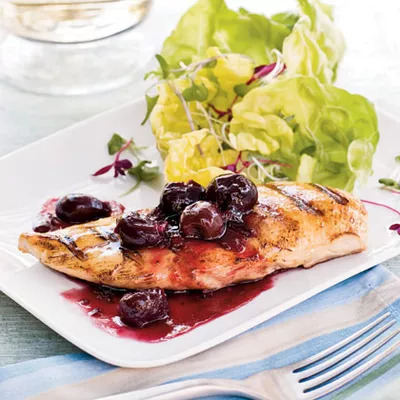 Instead of reaching for the takeout menu, whip up this easy recipe for chicken with spicy cherry sauce. The unexpected combination of chicken and cherries is post-workout gold. For those of us who hit the gym at night, dinnertime decisions can be a struggle. We know we should be replenishing our bodies with a healthy mix of protein and carbs, but the last thing anyone wants to do after a long day is spend an hour in the kitchen. With their natural anti-inflammatory powers, cherries are one of the best foods you can eat after strength training. Some studies even suggest that their large quantities of antioxidants can reduce post-exercise muscle soreness. While the cherries soothe your quads, all that lean protein (27 grams) will go a long way towards repairing your muscles--a crucial component of recovery. Chill out with this sweet, tart dish knowing that it’s working double duty to keep your body in tip-top shape.